Coq au Vin, Poulet au Vin Blanc, or my version, Poulet au Vermouth. No matter how you pronounce it or the wine you use, this is an amazingly delicious way to cook chicken thighs. 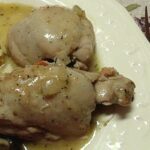 Traditionally bone-in chicken pieces are used as there’s a lot of flavor to be had from the marrow, but I used boneless, skinless thighs and the results were positively amazing. I wanted to call this dish Coq au Vin, but traditionally that dish uses red wine, thus the translation would not be correct. I actually prefer to cook with vermouth over any dry white. I first started using vermouth after Julia Child recommended it to me. Ha ha. Okay so she didn’t really tell me that of course, but I did read it in her book, [amazon_link id=”0375413405″ target=”_blank” container=”” container_class=”” ]Mastering the Art of French Cooking[/amazon_link]. I use vermouth in anything that calls for white wine and use it in many of my pasta dishes as well. Vermouth is inexpensive too, usually around $5.00 for a bottle. In the interest of thoroughness, I also referred to Julia’s recipe for Coq au Vin and she says “This popular dish may be called coq au Chambertin, coq au riesling, or coq au whatever wine you use for its cooking.” Now since I consider Julia to be the authority on French cooking, I felt pretty comfortable substituting after that. She also goes on to say that in France this dish is usually accompanied by parsley potatoes, I chose a buttered garlic rice by family request. [amazon_link id=”0778802485″ target=”_blank” container=”” container_class=”” ] [/amazon_link]I was thumbing through one of my many cookbooks, this one titled [amazon_link id=”0778802485″ target=”_blank” container=”” container_class=”” ]500 Best Comfort Food Recipes[/amazon_link] by Johanna Burkhard. 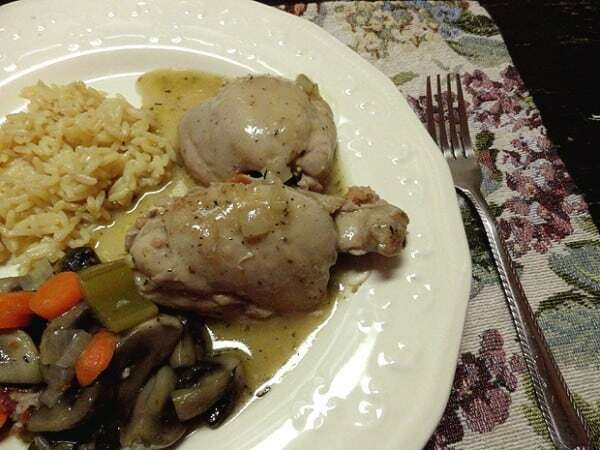 She had a recipe for Coq au Vin which called for red wine and bone-in thighs. I had some boneless thighs in the freezer and the family isn’t big on the bold flavors that red wine imparts. So I adapted it slightly, following the rest of her instructions to come up with Poulet au Vermouth. In this recipe the bacon is cooked and then you brown the chicken pieces in a little of the leftover bacon fat. 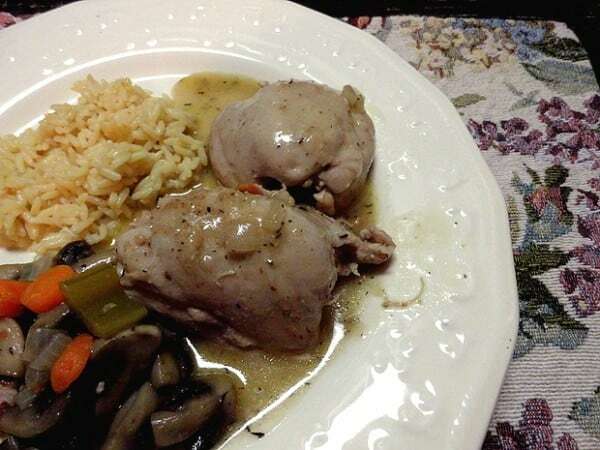 In Julia’s recipe, the bacon is blanched first, then sauteed in butter, then the chicken is cooked in the drippings. The method from Johanna’s cookbook is a bit easier, so I went that route. Another difference I noted is that Julia uses brown stock, or beef broth, and a bit of tomato paste. That makes sense since she’s cooking with red wine. I used chicken broth, which goes beautifully with vermouth. The gravy alone is worth making this dish. The flavor is fantastic and the chicken is just right. You could simmer it even longer if you prefer the meat be “fall off the bone” type tender and could server it more as a stew. The instructions below keep the meat pieces in tact and are cooked to perfection. This recipe came together and was on the table being enjoyed in about an hour. You can also use a whole cut up chicken, which is what Julia uses and what Johanna offers as a substitute. In a Dutch oven, cook bacon over medium heat until crisp. Remove to paper towels to drain and set aside. Drain all but 1 tablespoon of the fat from the pan. Add chicken pieces to the pan and cook until browned on all sides. Transfer to a plate. Reduce heat to medium and cook onions, carrots, garlic, celery thyme, salt and pepper, stirring, about 5 minutes. Add vermouth and 1 cup of the chicken broth and the bay leaf. Bring to a boil. Place flour in a small bowl. While stirring with a fork, slowly drizzle 1/4 cup of the reserved chicken broth into the flour. Stir with fork until smooth. Add the flour and broth mixture to the pan as well as the remaining chicken broth. Stir together. Bring to a boil, stirring until slightly thickened. Add chicken and any juices back to the pan. Reduce heat and simmer, partially covered, until chicken is just tender, about 45 minutes. Meanwhile, melt the butter in a large skillet over medium high heat. Cook the mushrooms, stirring constantly, until mushrooms are tender, about five minutes. Add mushrooms and reserved bacon to the chicken. Stir then simmer for 5 minutes before serving. Ohhh. I bet the vermouth valve such a delicious flavor to the sauce! I’m glad this turned out so well for you Amanda! I now won’t be afraid to try it…and will try it with Vermouth! I love any type of French chicken stew – It makes a great dish for winter.